NPPF commemorates the 45th UAE National Day at Dubai Head Office, a time to imitate upon the successes and great achievements of the country is truly extraordinary. 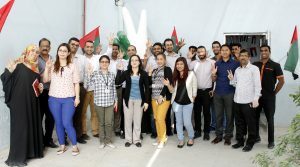 The office premises were beautifully decorated with our very own creative art designs and surrounded with UAE flag, organized with traditional activities including a grand-cake cutting ceremony and the singing of the UAE National Anthem highlighting the spirit of union. United Arab Emirates Celebrates nation’s independence and marks union of seven emirates under the ruler of the late Sheikh Zayed bin Sultan Al Nahyan, the first president of the UAE and the father of the nation. Preserving the heritage and traditions of the past led to a significant transformation in the economical, as well as the social life in the UAE. NPPF express its pride of the nation, has enriched the lives in so many ways with the support of the excellent staff.